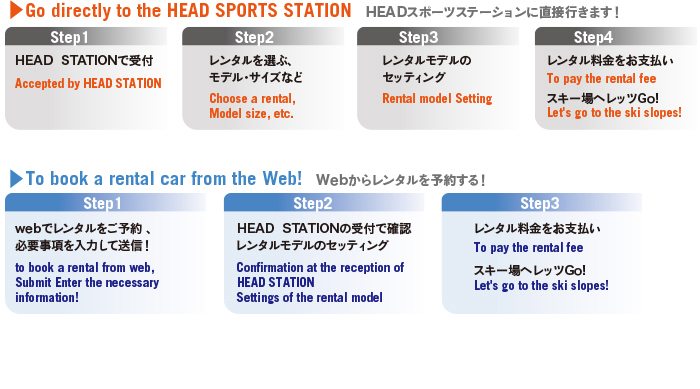 19/20 HEAD new model ski rental start!! 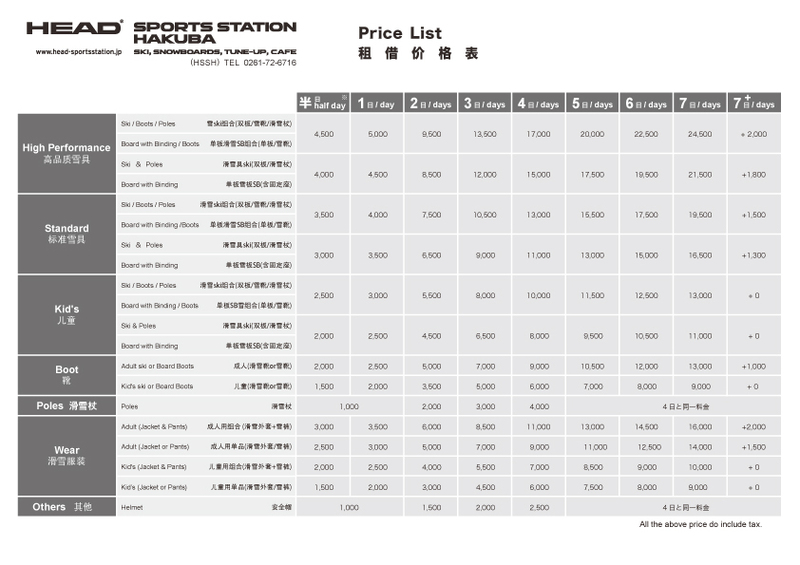 Rental ; You can easily HEAD station Hakuba, aligns the latest HEAD rental items that cover all categories. Junior It does not matter the level. Please spend a fun snow life the best choice that suits you. ※ half a day until 8:00 A.M.~1:00P.M, 12:00 NOON~5:00 P.M will be up. ※ please contact us at the counter for the subsequent 4Days fee. 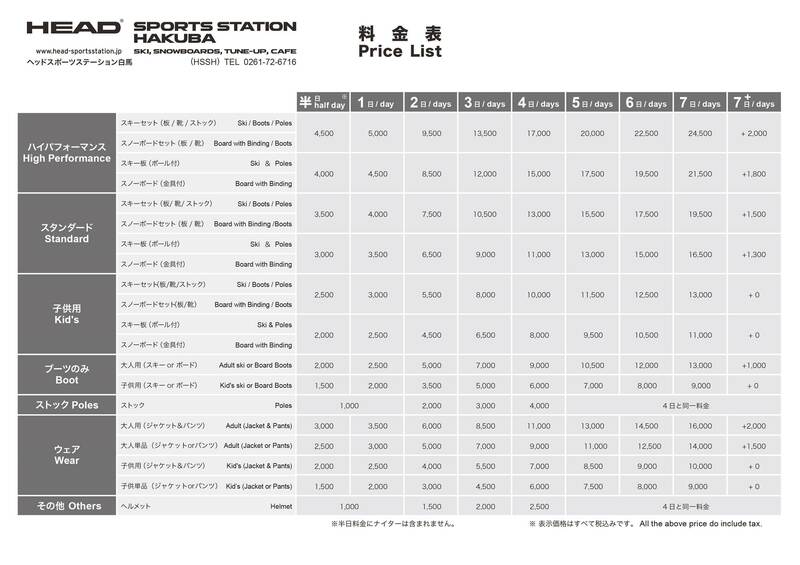 ※ night game fee of ski rental will be equal to the half-day fee. ※ Please bring and identification Passport when you use is. ※ Please note that there is no rental such as goggles, hat, gloves. We will have been sold in the SHOP. High Performance Carving ski provide satisfaction for expart skiers, you will be happy when you ride it! Enjoy Happo resorts! This is sucessor of Superlight Instinct ski who upgraded brand new Binding Plate. You are bale to push more aggresive and powerful skiing at on piste! V8 is totaly good high performance ski for this area, it’s ok to go both piste area. He has good ability as all round caver ski. you can enjoy skiing with him. V6 is mid fat ski on this V-Shape series who has good abiliry as all mountain carving ski. This is the lightest weight high performance ski, very easy curving turn at grooming area. Koroyd Sandwich construction covered your powerful skiing! We recommend if your ski style is easy, free and comfort. At least 4,000g (1 pair with binding) offer you lightest feeling and easy step at slope. 95% grooming slope is better this ski. Superlight Koroyd core model, including Graphene, makes a high performance ski which underlines lightweight and weight distribution. Superlight Koroyd core model, including Graphene, makes a high performance ski as women category which underlines lightweight and weight distribution. Nomen est Omen. With this on-piste beauty you have a high-performance, lightweight machine under food. This will be an all-time classic. A true race ski without those huge FIS radius. Easy race turns for the whole day. Want to ski like Ted Ligety? Can’t squat 200kgs? No worries, the iShape Pro will make you feel like a champion. Versatile fat skiLike a fine champagne, there’s only one size that counts the Magnum. Pop its cork and you’ll fly like never before. Think fast? Talk fast? Ski fast? Wanna be faster? Get on this front side master and speed up your life. Stay on track and rally through every corner with the ultimate side-stash-to-groomed ski. Remember these Titans for slaying the everywhere and the in-between. This category means are all round curving ski. Intermidiate, expert and high performance skier tend to these category skis, 70~80% grooming slope and 20~30% bump slope. You can go down everywhere with this category skis. Skiers who long for freshly groomed snow as much as they do perfect powder have a new friend, the wood-and-metal made Power Instinct. That’s all mountain curve ski, you can go any slop with this. Mid wide footprint (82mm) offer you high speed turn at bump and powder slope. Double metal construction is good edge grip at ice slope with high speed. Best choice ski if you push power at bump slope and powder slope. We recommend for 70% grooming slope and 30% powder slope. Finally, a mid-fat ski made ideal for mid-level skiers! Hard, soft, fast, or slow, find your inner Arnold on the Strong Instinct. The 98 is a Monster in any condition and is the ideal ski for those who dominate the front side and back side with equality. Stable and fast, yet nimble and fun. Fear not, this Monster will chew up and spit out any terrain that comes your way. Do you like POWDER? This category skis for POW lovers, HEAD big mountain ski KORE offer you if you like powder riding, 80% powder and bumpy slope and 20% grooming slope. KORE skis has great ability which are curving ski at grooming slope as well. We prepared twice footprint skis at here, 105mm footprint ski as KORE105 and 93mm footprint skis as KORE93. For those who live on the edge, the KORE 105 will get you even further out there. Prepare to lead your posse with the perfect blend of lightweight and high performance. At a versatile 105mm, this is the perfect secret stash seeker. Thanks new construction gives you lightness, flotation and control. You can ride easily on Hokkaido mountain area. Please select if you love 80% powder and 20% grooming slope, 105mm foot print ski is very good flotation at powder slope. High performance skier and expert skier will be satisfaction this ski. squarely at ski movie heros and their understudies. Ski the Cyclic and your buddies’ll tell you you must be butter, ‘cause you’ll be on a roll with this soft-snow machine. Be calm, cool, and…Collective flying all over the mountain. This machine cuts ruts on groomers as easily as figure 8’s in powder. Women segment ski created with women mind and women specific design. These are very light weight, easy turn initiation with do not power. Ski center position is little bit forward compare unisex skis, it’s very easy handling for all grooming slopes. Big width, big sidecut, and big technology make for humongous fun! This 2015 Ski of the Year takes soft snow skiing to new heights (and depths!). Technology has never felt this great! At 98mm, this amazing all mountain ski breezes through powder and glides over groomers. Light, fun, and easy, the total JOY brings a new meaning to all mountain high performance. Never has such an easy-turner been so incredibly emboldening. The first roll cage ever built with a ski in it, the Frame Wall is built tough for the rough and rowdy. Skiers who long for freshly groomed snow as much as they do perfect powder have a new friend, the woo-and-metal-made Power Instinct. In addition to posting on a website models we have prepared you a large number of new rental model to suit the type of customer.Please feel free to contact us to staff.